Do you want an officially licensed, exclusively designed Fraternity Crest Lapel Pin that is accurately produced and is the perfect way to show your pride for your Fraternity? The Desert Cactus Fraternity Crest Lapel Pin is modern, stylishly designed, produced to exact specifications and is an officially licensed product. It is manufactured to the highest possible standards and the Fraternity Crest Lapel Pin is perfect to attached to a blazer or jacket during formal and even non-formal fraternity events. Whether you want a stylish decoration or a gift for someone special in your life, we're here to make sure you get nothing but the very best. Desert Cactus has the largest selection of Fraternity products available on the market today. Quality as well as amazing value for money, this item allows you to support your sorority, fraternity house or organization by purchasing Officially Licensed products. Not completely satisfied? We'll make it right, no questions asked. All of our products have our 30-day return policy which means you can experience your new Fraternity Crest Lapel Pin risk-free. 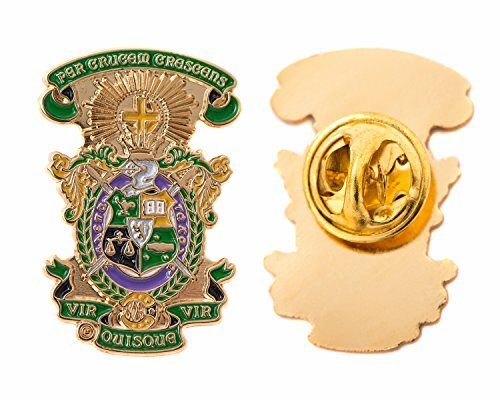 [ PRODUCT DETAILS ] our Fraternity Crest Lapel Pin is accurately reproduced with your groups crest and in its proper colors, features a closure pin back and is made of metal. Color shades may vary slightly from the photos shown. [ RISK-FREE ] All of our products have our 30-day return policy which means you can experience your new Fraternity Crest Lapel Pin completely risk-free. If you have any questions about this product by Desert Cactus, contact us by completing and submitting the form below. If you are looking for a specif part number, please include it with your message.